Organic agriculture shows several benefits, namely, it reduces many of the environmental impacts of conventional agriculture, it can increase productivity in small farmers’ fields, it reduces reliance on costly external inputs, and guarantees price premiums for organic products. However, its feasibility is often questioned due to the constraints in the use of chemical fertilizers and pesticides. For that reason, the general approach in organic agriculture is to deal with the causes of a problem (i.e., management practices aiming at preventing pests and diseases from affecting a crop) rather than treating the symptoms. 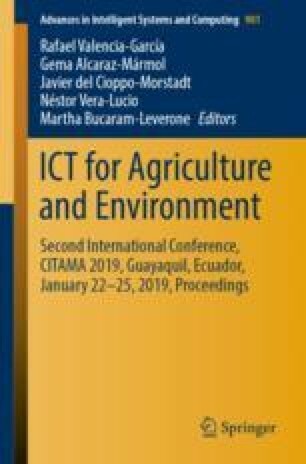 In this work we propose a fully-fledged, integral, comprehensive technological solution for the early detection of plant diseases and pests, and the suggestion of organic agriculture-compliant treatments. A proof-of-concept prototype has been developed that identifies the presence of harmful conditions in the crop and lists appropriate treatments. This work has been supported by the Spanish National Research Agency (AEI) and the European Regional Development Fund (FEDER/ERDF) through project KBS4FIA (TIN2016-76323-R).